After discovering that the trauma from circumcision permanently altered the baby’s brain in regions associated with reasoning, perception and emotions, the researchers were threatened to destroy their results or face legal action and immediate dismissal. Tinari and the nurses used the MRI machine for their study after the MRI machine operator granted them permission. Next they needed a test subject whose brain they could scan for changes pre and post circumcision. A pregnant nurse volunteered her son to be the subject of the study. Her husband had been putting intense pressure on her to have the procedure done, and it was her hope that the information gathered from the study would lead to the complete eradication of male infant circumcision. What did the MRI Brain Scans Reveal? 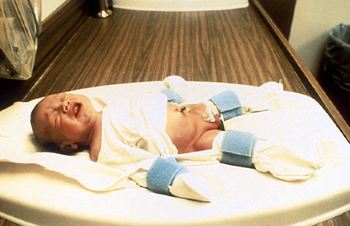 The researchers tightly strapped the infant to the traditional plastic “circumstraint”, and immobilized the infants head using the standard surgical tape. With no anesthetic used, the entire contraption was put into the MRI chamber, and the doctor performed the surgery using a sterilized plastic blade (since no metal objects can be used in an MRI due to large magnetic fields). [quote align=”center” color=”#999999″]The baby was kept in the machine for several minutes to generate baseline data of the normal metabolic activity in the brain. This was used to compare to the data gathered during and after the surgery. Analysis of the MRI data indicated that the surgery subjected the infant to significant trauma. The greatest changes occurred in the limbic system concentrating in the amygdala and in the frontal and temporal lobes. “Our problems began when we attempted to publish our findings in the open medical literature,” explained Paul Tinari. All of the researchers who participated in the study were called before the discipline committee at Kingston General Hospital who severely reprimanded them, stating that male circumcision was legal under all circumstances in Canada, and that studying the adverse effects of circumcision was strictly prohibited. The research team wasn’t allowed to publish the results of their study, and what’s more, they were forced to destroy all of their results. The penalty that would be imposed upon them if they failed to comply was immediate dismissal and legal action.